Sweet potato hummus adds an autumn spin to a traditional hummus. This dish is great for entertaining or a midday snack so you really can’t go wrong! Top it with some chopped nuts or toasted pumpkin seeds for a bit of crunch and pair it with a variety of crudités, such as cinnamon dusted pita chips or dried apple slices. 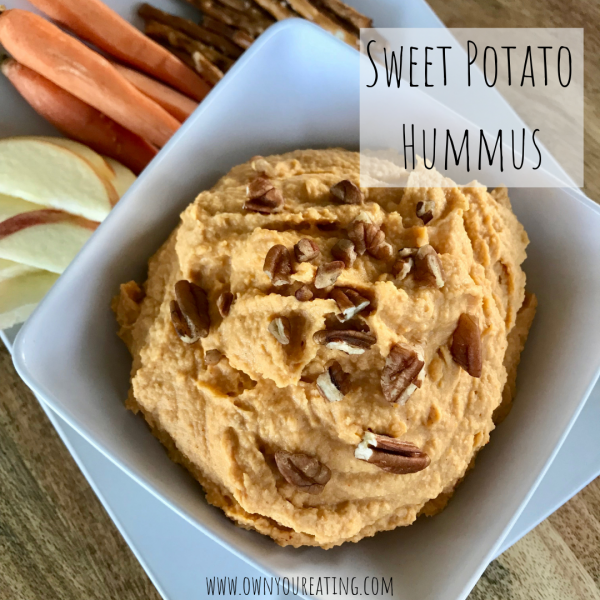 Sweet potato adds a surprising twist to make this hummus a bit more festive! Serve it with a variety of cut veggies, cinnamon pita chips and dried apple slices for an easy crowd pleaser! Roast or boil sweet potato until soft. About 1 hour at 375°F for a medium sweet potato. Remove skin after baking. Add in more olive oil or water to create desired consistency.